Many people that are doing the P90X workout have noticed Tony Horton talk about the use of the P90X Push Up Bars. Tony uses the P90X Push Up Bars in a number of the P90X DVDs. Of course he only uses them for upper body workouts and this is the only time they are needed. If you are like me then you are probably wondering if you really need to have a set of push up bars or not. The answer is that it really depends. Most of it comes back to how much strain you are willing to put on your wrists. Here are the sets of push up bars that Beachbody makes. I use push up bars as I have noticed the greater range of motion has helped me strengthen my upper body and chest even more. Helps keep your nose out of the carpet or wood floor. I own both. Bought the cheaper set first and felt a little limited with what they could do so I bought the second set which are much better. Both are very good push up bars but if you have the money I’d go with the Tony Horton Power Stands. What Workouts Will You Use The P90X Push Up Bars In? There really are not that many different kind of push ups you can do besides that and still use the push up bars. During those two workouts you will be doing “Diamond Push Ups” and “One Arm Push Ups.” You will not be using push up bars of any kind while doing those two exercises unless you are extreme and can hold your balance while doing a one arm push up on a bar. That is pretty impressive. 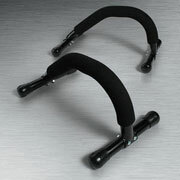 The main benefit of the P90X Push Up Bar is the less pressure that you put on your wrist. In both workouts you will be doing a lot of push ups and over time you will be putting a lot of weight on your wrists. This comes down to more of a precaution of further injuries when you buy the push up bars. When I first started doing P90X I did not have the push up bars. I did it the old fashioned way and went right down to the ground. My brother bought me a set of push up bars as a gift and I began to use them. The other reason you would want to use push up bars is that you get a intense workout. You are adding another 3-6 inches of depth to your push up. This makes it that much harder and you use more of your back and ab muscles to try and stabilize you from falling to ground. Your shoulders will feel it more too because they are the link between your biceps and back muscles. How Often Do You Use The P90X Push Up Bars? I now use the P90X Push Up Bars for every workout. The amount of push ups I can do in a set has not gone up from when I was working out without them but I know its because the push up bars make it harder. Since using the P90X Push Up Bars I have seen greater P90X results in my chest and arm area. I highly suggest anybody that wants to increase results and strength to buy a set of P90X Push Up Bars.